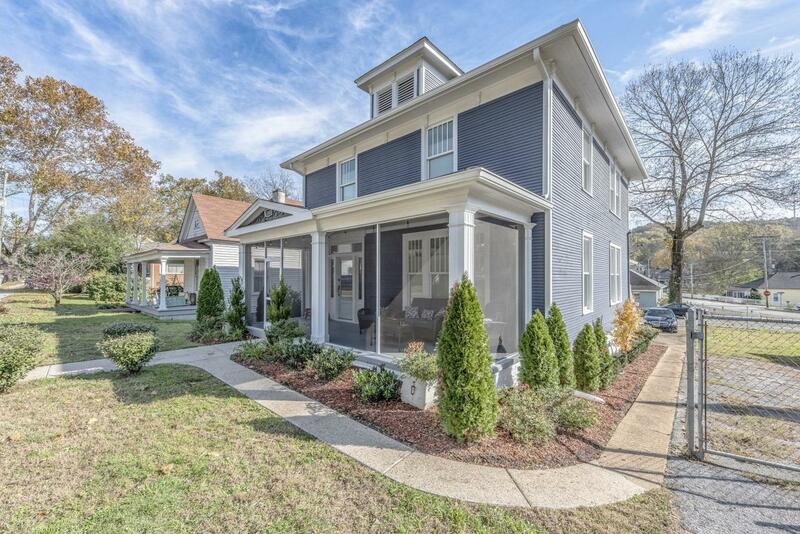 Rare opportunity to own a beautifully restored and completely updated 1896 American Foursquare home located in the heart of the Historic District of St Elmo. It has all new electrical, plumbing, HVAC, insulation, new all wood double pane double sash windows fitted with Levolor top-down bottom-up cordless cellular shades. Great attention to detail was given to the restoration of this historic home while maintaining the character. Original features include a lovely glass front entry door with transom and sidelights, refinished Heart Pine flooring throughout the main living areas, kitchen and bedrooms, solid five panel doors with the original hardware, two sets of beautiful pocket doors, solid wood stair railings and trim, built in hutch, extensive crown moulding throughout, two exposed gasbrick fireplaces, exterior wood siding and pea gravel sidewalks. The home has 2388 sq ft of living space with 3 bedrooms, 3 bathrooms, office space/mud room, sleeping porch off of the master bathroom and a detached two car garage, a rarity in St. Elmo. There are two screened in areas, the front porch and the back deck making plenty of outdoor entertaining space. The home has a functional open floor plan with specialty ceilings in the dining room and foyer. The kitchen is open to both the dining and living areas featuring white shaker cabinets, a oversized 10ft island with glass doors, quartz countertops, double gas range and stainless appliances. The bathrooms and laundry room feature beautiful tile, reflective of the time period. Location is key as the Neighborhood Greenway path is steps outside the front door, 1 block from the neighborhood park, close to hiking trails at Glenn Falls, Lookout Mtn. attractions and only 4-5 miles from downtown Chattanooga.